Therabath Professional Thermotherapy Paraffin Wax Spa For over 90 years paraffin moist heat therapy has been used to relieve pain, inflammation and stiffness caused by arthritis. A form of thermotherapy, paraffin treatments effectively increase blood flow to aid in rehabilitation, or to warm an area of the body prior to other therapies or exercise. Warm paraffin is also used extensively to soften dry, cracked skin by drawing moisture from within the body to the surface. Hands, feet, face, or elbows are left feeling soft and appearing more youthful looking. 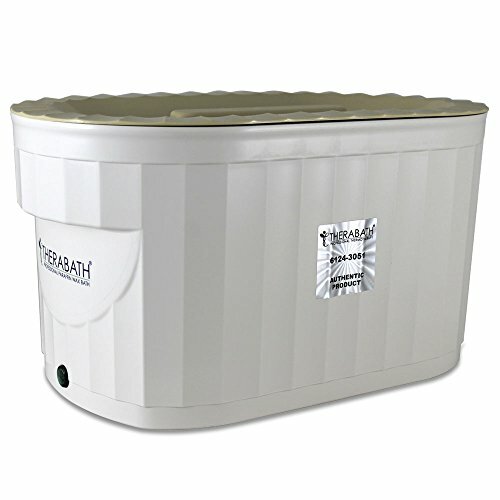 The Therabath Paraffin runs in an "always safe" temperature range and is designed to maintain the desirable therapeutic temperature range of 126 to 130 degrees Fahrenheit. Two internal thermostats ensure that the user will never immerse into wax that is too hot. In addition, the unit safely runs 24 hours per day (we say it's safer than your refrigerator!) so that it is ready to combat pain when the user is! Each Therabath Paraffin Bath comes with 6 lbs of Refill Paraffin Wax: • Made in the USA • Contains only FDA Food Grade ingredients • Odorless, colorless, and hypoallergenic, then lightly scented and tinted • Comes in 12 lucious scents, including facial quality ScentFree • Expertly blended with all required oils to remain soft and supple, while leaving no oily residue - no need to add additional oil! • Suitable for use in all paraffin baths • Paraben Free! DON'T SETTLE for an inferior paraffin bath! You deserve Professional Level Thermotherapy! Therabath is the answer to your arthritis pain and your dry skin. Get Your Therabath Today! NEW & IMPROVED! The TB6 model is a DEEP IMMERSION paraffin wax spa that is 25% deeper than previous models - 6 -9 lbs wax capacity - It will surely provide relief any arthritis pain you have! Made in the USA since 1962 - Anodized Aluminum Tank that is lightweight, durable and energy efficient - Always Safe Temperature Range allows the unit to run 24 per day - It's safer than your refrigerator! All Authentic Therabaths include 1 Therabath Paraffin Bath with Hologram Sticker of Authenticity, 6 lbs of Refill Paraffin, 1 white plastic grille, 1 tan lid, 1 tan IEC receptacle cord, Operator's Manual, and a 5 Year Limited Warranty. If you have any questions about this product by Therabath, contact us by completing and submitting the form below. If you are looking for a specif part number, please include it with your message.